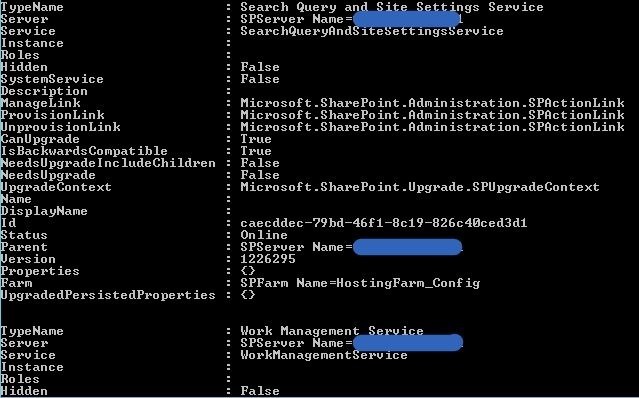 Get-SPServiceInstance allows you to get all the running Services in the farm with details such as Type, Name, Description GUID etc.… but in 2013 the Format is bit different and not listed down nicely like it was in 2010. too much to scroll down and find the specific Service’s details. Unlike in 2010 this is quite troublesome in 2013 for me to be honest because I only needed the Name | ID and Status listed so that I can simply pick the GUID of each Service. However New 2013 Output is more informative but isn’t what you needed in a specific situation. Just Like in below Figure. 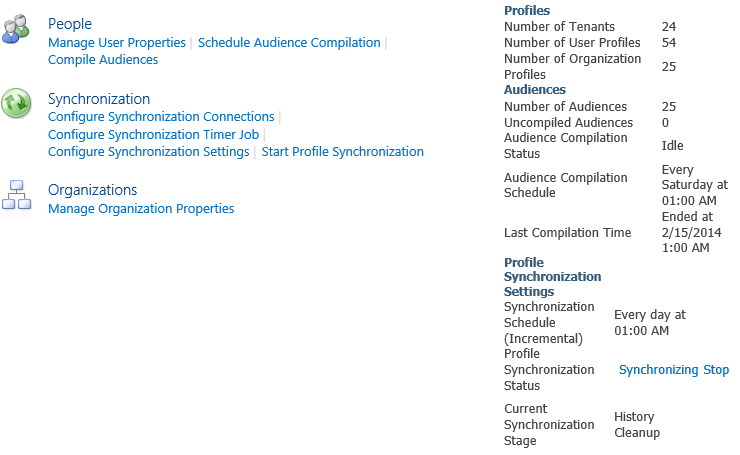 I was in a need of stopping User Profile Synchronization Service which was in Starting Stage at one of my SharePoint 2013 Environment. Running the generic Get-SPService didn’t bought the GUID of Synchronization Service but only the User Profile Service. If you thinking about the previous Get-SPService Instance result which is nicely listed all service instances, below is the way to get it. I was able to get all the Services listed with Core Information only which is same as 2010 output. 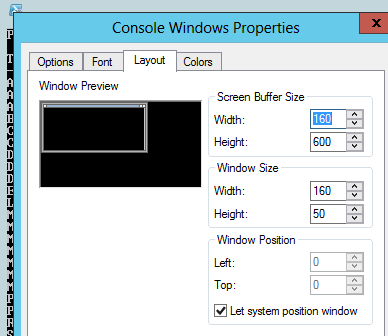 You can use below settings to get your PowerShell UI adjusted . Click on the little Shell icon on top of the PowerShell (Options button) and you will get below tab opened. Save it and close the PowerShell and Open again. Then Run the Command Again. Finally the Result in full List view. These are the core information’s I need and may be you are in a situation too. Hope This was helpful. lot more on PowerShell in Draft yet, will compose and Share soon ! Trying to Start a User Profile Synchronization through User Profile Application. Action completes but still the status is idle. After few minutes still the status is idle and seems there’s something wrong. Getting in to "Configure Synchronization Timer Job" and trying to Start sync through "Run Now"
5. Boomed ! and here it showed the real thing saying "Error Occurred when trying to run User Profile Synchronization in SharePoint 2013 "An update conflict has occurred, and you must re-try this action. The object UserProfileImportJob Name=User Profile Service Application Name _ProfileImportJob was updated by Domain\Service Account, in the OWSTIMER (14108) process, on machine SPAPPSVR. View the tracing log for more information about the conflict". the contents of the backend Configuration Database. this can even happen in standalone setups like i faced just now. 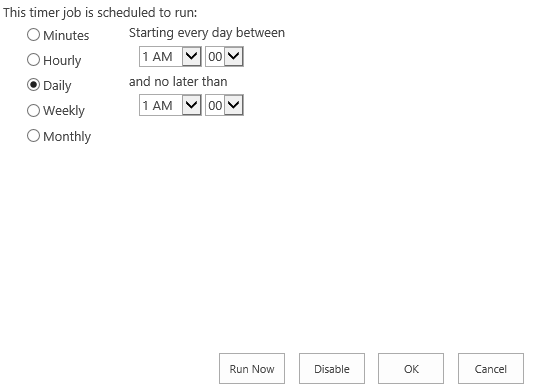 To resolve this we have to clear the file system cache on all Servers which are running SharePoint Time Service (this will run in all SharePoint Servers except the Database Servers). Let’s do below few steps and Microsoft also has written the guidance for the same in KB-939308. Before we proceed take a note that if your environment is a Production and running any scheduled stuff such as Workflow or whatever the timer service involved tasks do not execute this during peak hours (Day Time) try to make it in night time which is off peak as stopping Timer will cause re-starting of scheduled tasks which is critical when you are in production. 1.Type Services.msc in RUN and find the SharePoint Timer Service there and Stop it. 4.Delete all the XML configuration files in the GUID folder except the Cache.ini file. Do this so that you can verify that the GUID folder is replaced by new XML configuration files when the cache is rebuilt. Note : Do not Delete the folder or Cache file when you perform deletion. 5.Go ahead and double click on Cache.ini file to open it. 9.The file system cache is re-created after you perform this procedure. You may see some XML files are keeping generated inside the folder. Make sure that you perform this procedure on all servers in the server farm. 10.Go ahead and Start the Profile Synchronization now, it will sync smoothly. Error Occurred when Creating a New Connection in SharePoint User Profile Service Application. There was no endpoint listening at http://ServerName:5725 ResourceManagementService/MEX that could accept the message. This is often caused by an incorrect address or SOAP action. See InnerException, if present, for more details. Quite scary error which seems like due to ports blocking ? Not really, In my case it was Forefront Identity Manager Service which was stopped. I remember that I restarted this server after doing some heavy site collections creation and noticed the FIM Service has not been started automatically though it was set to automatic start. Just started it from Services and Connection came back to work. You will get "LDAP Server is Unavailable" Massage if you have checked SSL option at the same page (will depend on the environment that you are dealing with).